How can we enrich our lives, better understand our potential and fulfill our human destiny? What is the quest for immortality and how does it inform our purpose and our sacred Being? What can we learn from Native American wisdom and healing? 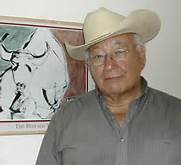 Dr. Momaday (Kiowa) is a noted author, recipient of the Pulitzer Prize for House made of Dawn, the National Medal of Art, and 21 honorary degrees from American and European univerities, a poet, novelist, playwright and essayist. He has read and lectured around the world and narrated several documentary films and was featured in Ken Burns series, The West. His novel, The Way to Rainy Mountain has been called a spiritual autobiography.